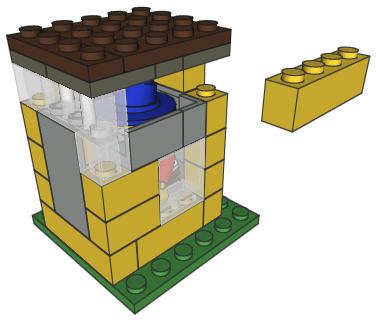 I want to make some minifigure-scale vehicles and devices, but I am wondering what the smallest possible minifigure enclosure might be. I know minifigures are not perfectly square. Their arms and heads keep them from fitting in a standard 4x1x5 shaped hole while standing upright (not that I would imagine that looking very good in a model). When in recline with the back of their legs connected to studs, they cannot lie totally flat and must lie at a certain angle. In a fully seated position. It would also be a bonus if anyone would also give the bounds for a minifigure in these positions but with the maximum amount of equipment. 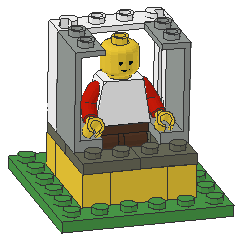 To reach this limit, you need to use the panels and windows to make room for the arms and more importantly the head, which is larger than a 1x1 brick. 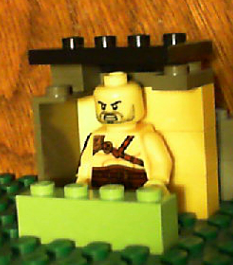 Note that I've had to use two plates to lift the roof above the stud on the head - you can cheat a bit and lower it one plate if you use a roof with a hole in the correct place - in the photos I'm using a 3x4 tile with 4 studs that comes with the collectable Minifigures, and the head stud fits into one of the cylinders underneath, but the edge of the 2x3 plate won't fit. 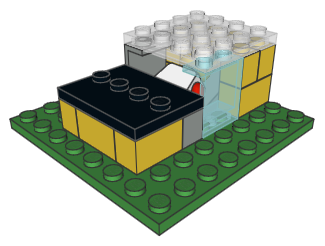 Again the minifig is angled to fit in this space so that the rim is horizontal, and once again there's judicious use of panels: 1x2x3, 1x2x1 and 1x1x1 Corners. With the arms and hands extended parallel to the thighs, the arms take roughly two and half studs worth of space from the joint of the arm. 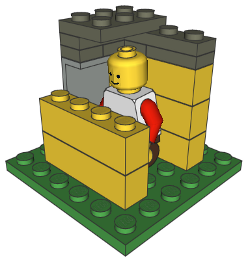 The image below show's a diagram of a minifigure sitting down on it's side. 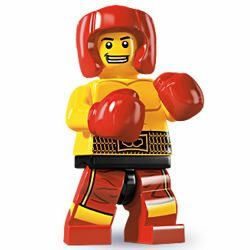 If you were to adjust both arms forward like a boxer in a defensive stance (albeit sitting down) the minifigure's arms will take the same amount of room in a different possition. Not the answer you're looking for? Browse other questions tagged minifigures size or ask your own question. How tall is a standard LEGO minifigure? What are the largest Technic-compatible tires on the market? 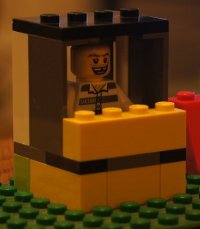 What kind of yellow is used for a typical minifigure? Is the visual.ly infographic information about the minifigure reliable? Why are minifigure wrenches tapered at the end? What are the dimensions of LEGO 10221 Super Star Destroyer?